Why someone hasn't done this before is anybody's guess, but the DigiTech® team has jumped way ahead of the pack with their new GNX3™ Guitar Workstation. For the first time, guitarists now have a complete, full-featured floor processor, plus an 8-track recorder combined into one unit, giving them a whole new level in creative power at a very affordable price. Now, when a guitarist is practicing at home or is at a band rehearsal or jam session, those inspired solo moments won't be lost forever. And those magic riffs that come out of nowhere or are carefully worked out can be captured so you can get them down later. Just start the built-in 8-track recorder and all those "Wow, that was cool!" licks will be instantly recorded. And you can operate the recorder hands free. But, the GNX3's power to unleash a guitarist's creative potential is fully realized in song writing. By utilizing the built-in drum machine and bass amp modeler, a guitarist can first lay down rhythm tracks on the built-in 8-track recorder. 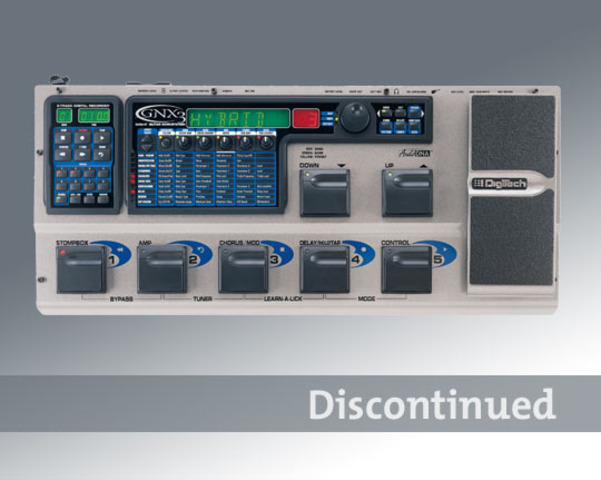 Then selecting from the GNX3's unlimited library of amp models, DigiTech's exclusive and powerful CIT™ (Cabinet Imaging Technology) feature, and a complete set of on-board effects, the guitarist can then lay down the guitar tracks. When that's finished, vocals can then be recorded on the remaining tracks using the balanced XLR mic input on the rear of the GNX3™. Even keyboards and DJ scratching can be added through the rear-panel instrument input. There's no limit! Plus, recording time can be greatly increased utilizing the SmartMedia™ card slot on the rear panel. What can I use to control the recorder externally? The optional DigiTech FS-300 allows remote control of the recorder transport. This frees up the GNX3 footswitches for toggling effects or changing presets while recording or looping. Does the mic input provide phantom power? No. We recommend using an external phantom power supply or microphone preamp when using condensor microphones. How long of a loop can be used? The length of the loop is determined by the length of the first loop you record. Each subsequent layer or loop will automatically fit the length of the first loop. The length of the first loop only depends on available memory-from milliseconds to hours. Can the recorder function as a looper? After entering loop mode, each of the recorder's 8 tracks can be looped and layered just as a traditional looper. With the power of 8 separate loops and expandable external memory, the GNX3 might just be the most powerful looping device available. Once you stop the loop function, all the audio remains in tact on the SmartMedia card-or in the internal memory for further development later. Will the GNX3 erase digital pictures or other data I have stored on my card? No. The GNX3 will only be concerned with audio tracks that you recorded using the GNX3. Any other information on the card will remain in tact. What is happening while the word "BUSY" appears in the display? When a SmartMedia card is inserted into the GNX3, the card needs to be initialized. This process involves reading the card to determine if existing information is present and allocating any empty space to the recorder. The larger the card, the longer the "BUSY" process. Can I have more than one song on a single card? Yes. Songs are arranged in folders with individual audio tracks inside each folder. You can create as many separate songs as you want depending on the size of the card. What happens if all of my tracks are full and I still want to add more? Unlike other recording devices, the GNX3 allows you to bounce a complete stereo mix from all 8 tracks down to a single track or pair of tracks (for stereo mixes) without losing audio from the tracks to be recorded over. This frees up memory and tracks for more recording. What mixing functions are available on the GNX3? After recording your tracks, the controls on the GNX3 allow for mixing the levels and the stereo position of each individual track. Do I have to start playing immediately after pressing the record button? No. The setup menu allows for a pre-roll of 4 or 8 beats. A click track can be configured to play during the pre-roll to help set the tempo before the actual recording starts. The pre-roll can also be disabled for quick-start recording. Can I add effects to a track after recording it? Yes. Using the re-amp function, an internal track can be re-routed through the GNX3's powerful effect section to add any combination of effects or amp models to the recorded track. Once the desired effect is found, the original track can be overwritten with the new one. What if I make a small mistake, but want to keep most of the track I just recorded? The GNX3 allows for punch ins/outs. Practice the faulty section until it is just right. Then punch in and record it. Punch out when you're done. The audio before and after the punch section remains in tact. You might also try the quantize function which automatically corrects notes which are slightly off-beat to the nearest eighth or sixteenth note. So, can I record a full arrangement with the GNX3? Yes. For example, after recording the drums on track 8, you might go back and lay down the bass on track 7. Then add a couple of guitar parts on two other tracks. You can even use the XLR mic input to record the vocals. All of this can be done while monitoring existing tracks through the GNX3's main outputs or headphone outputs. Can I record the rhythm patterns from the onboard drum machine? Yes. In fact, you can create new patterns by changing the pattern while recording the drum track. How many different inputs are available for simultaneous recording? Two. There are three total inputs for recording: microphone, guitar and line (jam-a-long). Any two of these can record to any two of the recorder's 8 tracks. This allows for stereo recording from an external source. Use any individual input for mono recording. Can I save my recordings as MP3 files for use on the Internet? Audio files can be transferred to a computer using an optional SmartMedia card reader. Files are stored in the .wav file format but can be easily converted to MP3 format by using most audio software packages available for the computer. What resolution and sample-rate are used for the recordings? The recorder always records at 16 bit, 44.1kHz. Using the different recording modes, recording time is increased by limiting bandwidth. You'll notice a slight loss of frequencies in the upper range above 10kHz as the recording mode is changed from "Normal" to "Economy." What size of SmartMedia card is recommended? Generally, we recommend using the largest SmartMedia card available (currently 128 mb). This will afford you the longest recording time and is usually the best value for your money. Do I have to have a SmartMedia card to record? No. The GNX3 includes 16 megabytes of internal memory for recording. In Economy mode, this allows for 12 minutes of recording. How many minutes of audio can I record? Using a 128 megabyte SmartMedia card, the GNX3 is capable of recording up to 25 minutes of CD quality audio. The time can be divided among the 8 available tracks or used completely on a single track. Recording time can be increased by using the "Normal" or "Economy" recording modes. Time is increased to 50 minutes or 99 minutes respectively. Can you swap a SmartMedia card into another GNX3 and have it play back your saved tracks? Yes. Any GNX3 can playback music created by any other GNX3 when saved to the SmartMedia card. When you dump the contents of a SmartMedia card into your computer does it retain the 8 tracks separately? Yes. The file transfer will result in a set of mono wav files which lets you retain track sync. The number of files depends on the number of recorded tracks in recorder. What bass amp models does the GNX3 have? Notice that there is a bank of BASS presets in BANK 5 labeled BASS AMPS. Presets 21 through 25 are for the Bass dudes who want to plug in their basses. Actually preset 22 is for guitar players who wan to lay down a Bass track to the recorder. Notice that when selecting an amp type using the pots that selections 18, 19, and 20 are the bass amps. The version of GenEdit that is compatible with the GNX3 has the Bass Amps as well. How come the click track keeps playing when I try to sync drums to a track? To use sync drum function with a drum pattern you choose, it is necessary to first go into set-up menu and turn the click track off. How can I monitor in true stereo? To monitor in true stereo real time, set Rec Input in song set-up to G+R1->Mic2. In the Utility menu, select G+L Rec Rt for the Analog Out. On the guitar side, you need to set up a clean, direct patch with no amp modeling, effects, or expression pedal assignments. I just recorded a couple of mono tracks. Where are they? Check your analog output setting in the Utility menu. Can I undo a track other than the last recorded track? Yes. After pressing Undo the first time, press the track # you want to undo, then press Undo a second time within 3 seconds. How come my GNX3 won't let me select reamp for the record input? You can only reamp mono tracks. Can you use the Cakewalk software that comes with the GNX3 to create a single track with many different drumbeats? Yes, you can arrange and assemble .wav files in Cakewalk or any other program designed to edit audio of this type. Once you are finished with the .wav files, you can use a USB SmartMedia card reader to transfer .wav files to and from the SmartMedia card. This makes editing drumbeats a snap! What are the system requirements for the Cakewalk software? Windows OS. 98,ME,2000. Not sure about XP. Can you record backup tracks to accompany your live playing and if so, how many and how do you access these tracks while playing (do you hit a pedal?)? Yes, if your backup tracks are converted or available in the .wav file format, you can transfer the .wav files to a SmartMedia Card. The GNX3 allows for up to 99 different song locations. You are only limited to the amount of memory on your SmartMedia Card. A card 128 meg size will hold up to 24 minutes of CD quality audio. The pedals will allow you to select a song location and provide play, rewind, stop, etc. Does the quality of your sound card affect the final recording quality when using uploaded files from your GNX3's media card? And where do you connect the media card (USB, parallel port, etc.)? The only way your sound card would affect the sound quality is if you were to use the analog 1/4" outputs of the GNX3 to transfer your tracks to the computer. If you use a SmartMedia card reader, you will only be limited by the quality of the record mode used to record the original tracks. Also, if you use the S/PDIF digital output, there would not be any generation loss to your sound card. This is only available if your sound card is equipped with a S/PDIF type digital audio input. When I insert the SmartMedia card in the GNX3, what happens to the GNX3 internal memory? The internal memory on the GNX3 is set aside when a SmartMedia card is inserted. Function enables when the SmartMedia card is removed. I need to update the firmware in my GNX3, will this procedure erase my songs or any individual tracks that I have recorded? No, updating the GNX3 firmware does not affect any pre-recorded material either on a SmartMedia card or in the internal song memory and will NOT erase any tracks or songs. I just recorded some tracks onto a SmartMedia card, now I want to add some .wav files onto the card, how do I do that? Make sure to perform a CARD to PC function before removing the SmartMedia card from your GNX3. Press the SETUP button several times until your GNX3 display reads CARD >> PC. Press the RECORD button. When the counter in the time display reads 0, the display will read PC READY, then say REMOVE. Pull out the SmartMedia card and place it into your computer's SmartMedia card reader. Add the .wav files making sure to follow the proper naming conventions listed on page 47 of the user's guide. When you put the card back into the GNX3, the files will be converted back to the GNX3 format. Can I record stereo tracks into my GNX3 from an external source and actually monitor what I am recording in stereo? Yes, if you plan to record in stereo from an external source, you will first need to create a user preset with all effects set to off and amp/cabinet models set to DIRECT. Then you will need to enter song setup and choose G>1 M>2 as the record input. Use the guitar input as your left input and the MIC input as your right input (you may need to use an adapter to convert the XLR connector to 1/4" when recording line level sources like CD players or keyboards). In order to monitor or listen to what you are recording (as you are recording it) in Stereo as well, you will need to enter the GNX3 utility setup and choose G>L R>R as the Analog Output Configuration. While you are monitoring or listening to the stereo source, use the MIC input adjustment knob to balance the right input level and use your "empty" preset's amp level paramter to adjust the left input level. Generally, it is best to set the amp level at maximum and use the mic level to balance your right input to match. When you are done recording and want to listen to the tracks you have recorded in stereo, you will need to go back to the Utility section and change the analog output back to stereo mode. NOTE: you will only be able to monitor or listen to your input source in stereo with the Analog 1/4" outputs or headphones. You will not be able to monitor in stereo through the S/PDIF output. Does the GNX3 send MIDI program change commands? Yes, the GNX3 will send midi program change commands. There is a misprint stating the contrary on page 68 of the owners manual. Do I need a computer sound card to transfer my recorded tracks from the GNX-3 to the computer? Yes, if you need to transfer any tracks that are recorded to your GNX-3's internal memory, you will need to use either the analog or digital audio outputs on the GNX-3 in order to "play" them into your computer in real-time. Recording audio into a computer from an external source will generally require the use of a sound card and recording software. If your tracks are recorded onto a SmartMedia card, all that is required to transfer them to the computer is an inexpensive SmartMedia Card Reader. If you are transferring tracks to the computer that were recorded with the GNX-3, make sure to perform the CARD>PC function first. Then when prompted to, remove the card and place it into your SmartMedia card reader to access the tracks in your computer. Why won't any of the CC#'s that are assigned to control the (Coarse) parameters work for my GNX-3? Try using the CC#'s for (Fine) control. The CC's have been combined together, only the (Fine) control CC#'s will function on the GNX series units. On the GNX-3, how can I record a track that is longer than the first track I recorded? Or, how can I extend the length of an existing track? Enter the song setup menu of the song you are working on and press the setup button until you see AUTOSTOP appear in the display. Change the setting to OFF. If you intend to record a second track longer than the first, or longer than any of the existing tracks, you will need to have the AUTOSTOP feature turned off. After the longest track you intend to have has been recorded, you can go back to the setup and turn AUTOSTOP back to the ON setting. The GNX-3 will now automatically stop playback or loop at the end of the longest recorded track. Why is the time counter counting backwards on my GNX-3? time remaining in the song during playback. I just recorded tracks on my GNX-3 using the input G1 > M2. I have the guitar track on track 1, how come my mic track didn't record onto track 2? Where did my mic track go? On the GNX-3, selecting G1 > M2 in the recorder setup menu, as the record input, will not automatically arm 2 tracks for recording. You will need to either select stereo mode ON or arm 2 sequential tracks (1 and 2, 3 and 4, 5 and 6 or 7 and 8.) before recording them. On the GNX-3, I chose G + MICMOD as the record input, how come I can hear delay as well as the mod effects? When choosing G + MICMOD as the record input on the GNX-3, the Mic signal will include both Mod effects and Delay effects. If you do not want Delay included, simply edit your preset to have Delay effects turned off before recording the mic signal. On my GNX-3, I tried to change the record quality mode from CD to LP or EP and it won't let me change the setting. Why? If you have any tracks or material pre-recorded on your GNX-3, the record quality mode will be "locked in" to the mode of the first track. In order to change this setting, you will need to delete any previous tracks that were recorded with the other mode or erase the song. The record quality mode of the first track recorded on each song determines the record quality mode of all the tracks for the entire song. Be sure to set the desired mode before recording any tracks. I am using the S/PDIF output on my GNX-3 to my computer's sound card. I can't hear my recorded tracks, what happened? GTR + REC = You will hear the Guitar and Recorder sections mixed together at the Digital Out. G-DRY = You will only hear the Dry guitar signal only (no effects) at the Digital out. I just bought a GNX-3 unit a couple days ago and I tried to merge the tracks together and I did what the manual says, I clicked it to a yellow track along with a red track and hit record, it went thru the song, but still there were the same tracks there with no tracks together. When you are done merging tracks, the original tracks are not automatically deleted. If you recorded 4 tracks, then merged tracks 2,3,4 (these tracks green) onto track 1 (yellow), you would press record and let the song play through (completely), then, the result would be: Track 1 will have all 4 tracks mixed together. Tracks 2,3 and 4 will still be the same as they were but can now be erased if you don't need them. You can mute them (led off) and listen only to track 1 (green) and hear all 4 tracks together. Merge cannot be un-done. Just remember, any tracks that are green (play-back color) will be merged (recorded on top of) any tracks that are yellow. Only 2 tracks can be yellow at a time. Tracks that are yellow do not have to be empty in order to use them for the merge function. None of the tracks should be red unless you are recording new material at the same time you are merging tracks. What is the hard reset for the GNX3? Press and release MODE button. When display reads TOE DOWN, put expression pedal down and press/release lit footswitch. Put toe up, press/release lit footswitch. V Switch will appear in display. Put pressure on toe down position. This completes the process. What do I do when the free Cakewalk Guitar Tracks 30 day trial version is up? When the 30 days after first installation are ending, open the Help window on the program, then click on About Cakewalk. A serial number will be given. Save this number. Go to Help again, then to Register Online. Enter this number and you will get an unlock code to keep using the program. I record but can't hear playback. Your output is improperly set. Press Utility. Turn Data wheel counterclockwise until display reads MONO or STEREO only. Then you will be able to hear what you record. How do I delete the factory sample recordings? Press and hold the Record button. then press and release RECORD again. How do I download patches from the user patch library into my gnx3. When you downloaded the patches from the web site to your PC, were you able to extract them and view them in your document/settings? You may need to do a windows search to locate them. If so open a patch folder to view the different patch titles and double click on the file that you would like to import to GEN EDIT. You need to have the gnx3 connected via MIDI in order to do this. By double clicking you are sending the file to gen edit. You should be able at this point to see the title of the patch along the top of gen edit and view the settings. In the gen edit file menu select STORE TO DEVICE AS. A dialog box with the user location that the patch can be stored to will appear. This lets you store the new patch in any of the user locations. You will now be able to see the title of the new patch displayed in the GNX3. How do I put recorded tracks into Cakewalk? You will need a smart media card reader on the computer. Once you have that you should be able to read the GNX files on the computer. Open up the cakewalk program. Select insert and then wave file. Point it to the smart media card reader and the track you want to import. Do this process for each track and then you can edit and mix them inside of Guitar Tracks. When downloading the firmware upgrade, the upgrade didn't complete, now my unit looks dead? What can I do? When a download is interrupted, it is characteristic for the unit to appear dead. Try running the updater and when it shows "Trying to connect", power up the GNX3 right then. You may need to do this a couple of times, as the timing can be a bit tricky. You can also redownload the previous software from the CDROM that came with the unit. What is the low level format for the GNX3? Press and hold SETUP button. When LOWLEVEL appears on display, let go of SETUP. Press and release UNDO button. I do not hear playback from the GNX3 recorder.